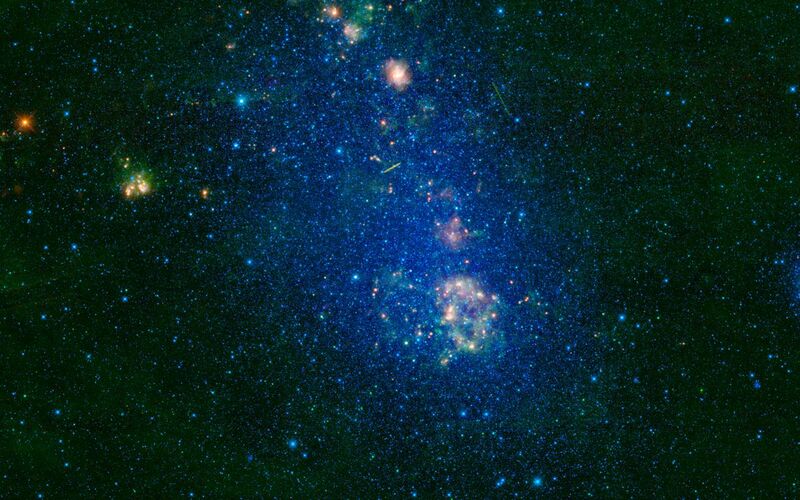 This image captured by NASA's Wide-field Infrared Survey Explorer (WISE) highlights the Small Magellanic Cloud. Also known as NGC 292, the Small Magellanic Cloud is a small galaxy about 200,000 light-years away. The Small Magellanic Cloud is named after the Portuguese explorer Fernando de Magellan who observed it on his voyage around the world in 1519. Since it is visible to the naked eye in dark-sky conditions, it is likely that people in the southern hemisphere observed the galaxy long before Magellan recorded it. Located in the constellation Tucana, the Small Magellanic Cloud looks like a wispy cloud that circles the south celestial pole. 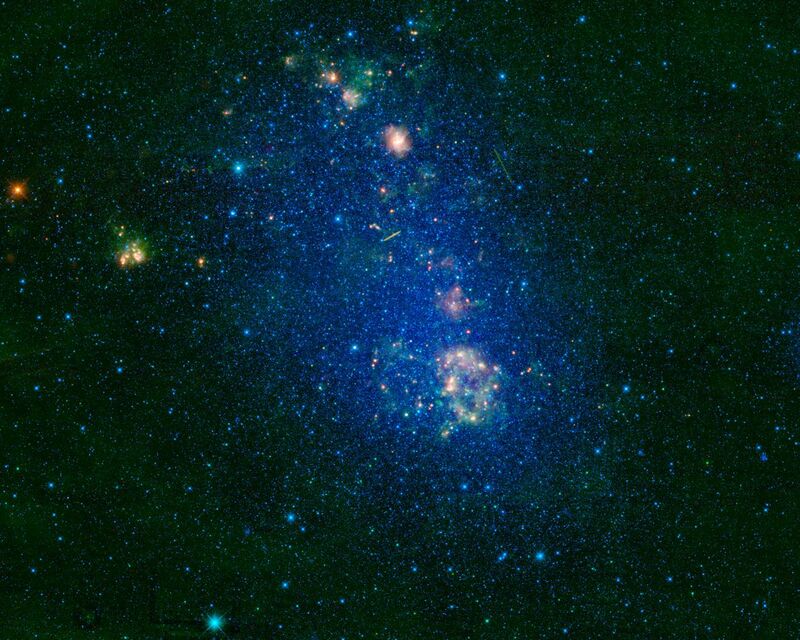 Nearby, but not visible in this image, is the Large Magellanic Cloud, a sister galaxy to the Small Magellanic Cloud. Astronomers originally thought that both galaxies were orbiting our Milky Way galaxy. But recent research suggests that they might be moving too fast to be bound by the Milky Way's gravity and are passing by for the first time. This WISE image illustrates why the SMC is considered an irregular galaxy. Galaxies are classified according to their shape, such as spiral or elliptical. Irregular galaxies don't fit into any of these categories -- they are unique in shape. The two streaks seen in the upper half of the image are satellites orbiting Earth, which happened to pass in front of the Small Magellanic Cloud when WISE captured this view. This mosaic image was made from all four infrared detectors aboard WISE. The color in this image represents different wavelengths of infrared light. Blue and cyan represent light at wavelengths of 3.4 and 4.6 microns mostly emitted from stars. Green and red represent light at 12 and 22 microns, which is mostly light from warm dust.